The first arboretum at a university in Texas, this on-campus garden spills over 10 acres and lies along the Lanana Creek Trail. 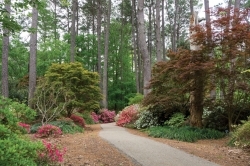 Enjoy the wide diversity of plant life, including rare trees, shrubs, vines, perennials and the SFA horticulture program’s SPROUT vegetable garden. Visit the Monarch Waystation at the Jim and Beth Kingham Children’s Garden.